The weather was better than I'd expected the first couple of days. Monday we did the so-called Golden Circle sights around Reykjavik and it did rain, but not with any enthusiasm, and never for very long, and the sun even came out a few times. Yesterday it was colder and rainier, perfect for an afternoon spent dodging icebergs in a small boat in the Glacier Lagoon. 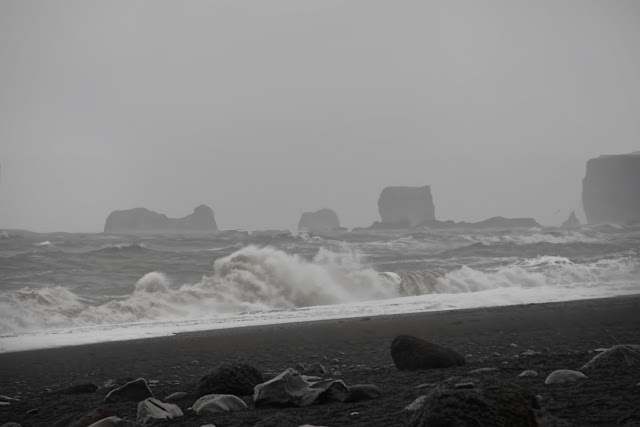 And today, Iceland had record rainfall, accompanied by wicked winds. We started out wet, and just got wetter and wetter. This is Reynisfjara, a long stretch of black lava sand and rock between stacks of basalt. 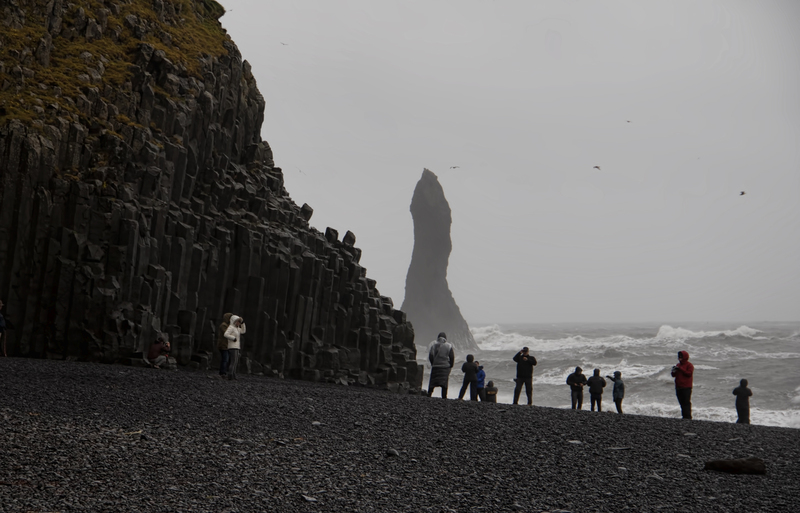 Gunnar, our guide, had warned us that the beach could be very dangerous (people are swept away by the waves even when there aren't hurricane-force winds egging them on) and that he might make us turn back. But I turned back long before he did. 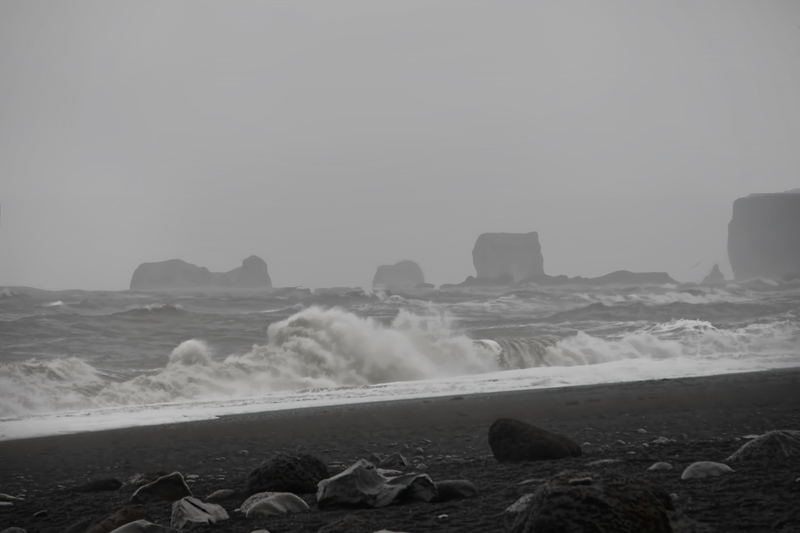 The winds were so strong they made me stagger, and the rain and sand hitting me in the face at least guaranteed I won't need to exfoliate for a while. There was no point in trying to take pictures -- I could barely see, and I couldn't hold the camera steady. 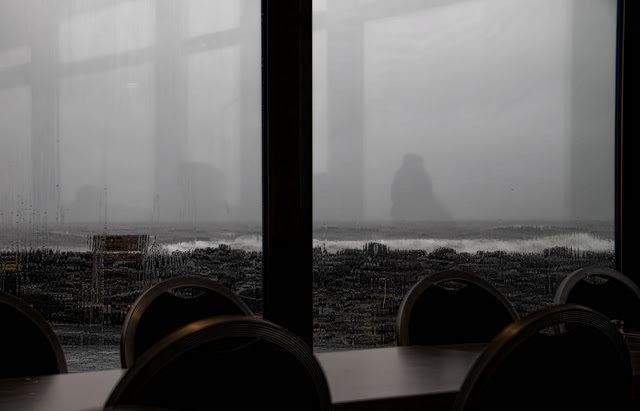 I decided that by far the best view of Reynisfjara was from inside the cafe, even though I didn't have any money on me and couldn't buy the cup of hot coffee I desperately wanted.